I am going to attempt to give some post-apocalyptic va-va-voom to toy castle components that look like those above. Left to right is a tower, a wall, another tower and a gate section. 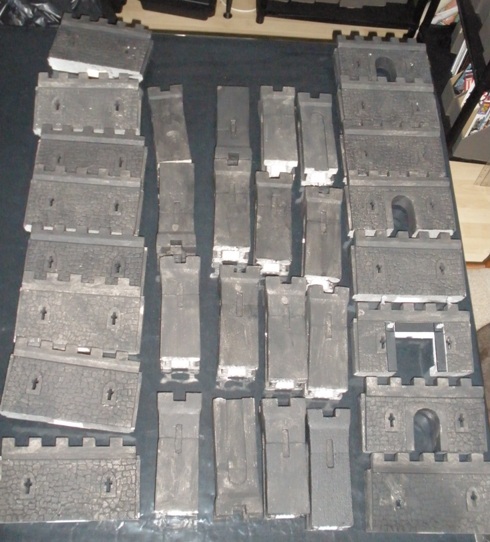 In total I have four gate sections, twelve wall sections and sixteen towers. All of the pieces are made from expanded, beaded polystyrene and so are very light, but unsuitable for spray painting, which will melt that material. As noted earlier, the parts were hand painted with a mix of black emulsion (latex) paint and some filler back in the mid 1990s. 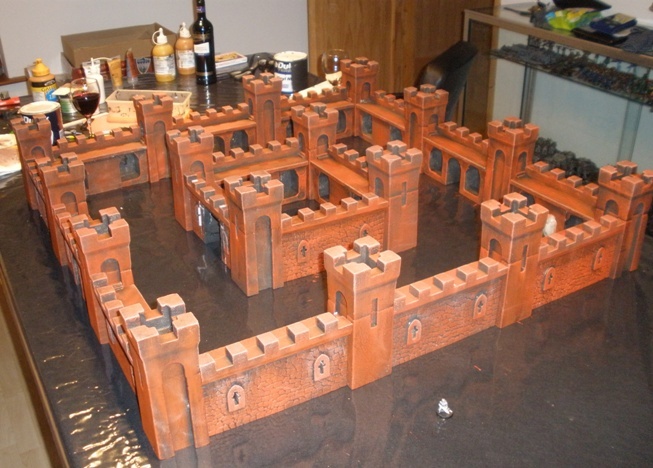 The first step in 2011 was to decide what colour to hand paint the castle. I didn’t want a pedestrian and realistic brownish grey as I wanted to remove the the look of the finished product from that of a real castle as much as practically possible. Blues, greens, purples and the like would give a finish that looks a bit too fantasy for my tastes, a bit too concept album cover, a bit too “Heavy Metal”. I considered a yellowish/brown but the board that I play on is black with a drybrush of Raw Sienna so I feared that the castle would blend in too much if it was the same or similar colour. 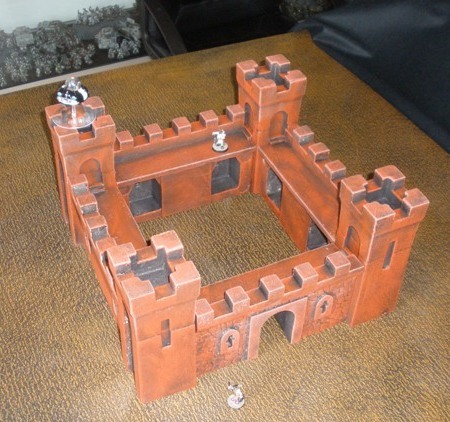 I also wanted to crudely “weather” the bottom of the castle walls with the game board colour once the fort was complete. That wouldn’t work if it was the same colour to start with. So after some indecision and in a weird bit of parallel evolution with the foam rocks that I chopped up and sprayed on the same day, I decided to go for a red oxide colour. This rust like colour fit with some of the notions and references that I had in mind with a large amount of rusty scrap and wreckage materials involved in the forts imaginary construction. I hope that it works out, but at this point it is too early to know for sure. Therefore I overbrushed the whole thirty two sections with a Red Oxide acrylic. I then mixed the red oxide with a little emulsion off white and drybrushed some of the upper areas a little, just to give a small bit of contrast. I had trouble taking photos that show the colour properly. Indoor, night time and artificial lighting made the whole thing look a lot more orange than it does in reality Im afraid. Therefore the work in progress shots are all going to look a bit off. Hopefully I will be able to get some halfway decent shots in once it is complete. At this stage I took the cloth off the table and set up one quarter of the fort on the gaming surface, just out of curiosity to see how it looked against it. The colour doesn’t look brilliant with the table I think, but I think that it is within acceptable parameters (plus it’s a crappy washed out photo). Not that I had any choice at that stage: I was unwilling to to repaint the whole thing yet again. The emphasis here had to be to finish a project that had been in various half finished states for years, by hook or by crook. The look of the final model will hopefully be quite different anyway, between a wash or two here and there and the addition of some other elements to break up the redness. Fingers crossed. 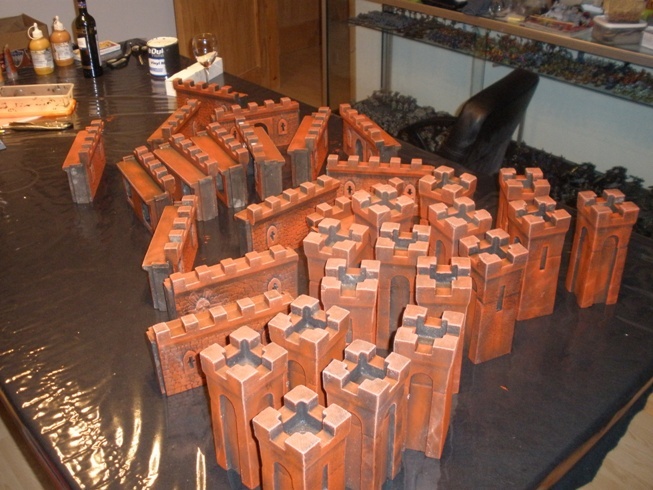 Also at this stage I set up all thirty two castle pieces as a perimeter wall with bastion. I did this mainly because I think it looks cool and I wanted to see what it looked like now that it was brownish red. If nothing else it should give readers an idea of the area that the fort occupies. Due to the number of towers it reminds me a little of a shot from the Assassins Creed video game. The table that the model sits on is 4 x 8’. Also bear in mind that the little grey thing in the foreground is an EM4 plastic trooper. Fully assembled the fort occupies approx 3 x 3’, which is quite big in gaming terms (as an aside I tend to think in terms of imperial measurement when looking at gaming tables and metric for everything else. That’s Warhammers fault). That was quite enough terrain work for one Saturday afternoon (as I made the foam rocks that day too) so I went to bed. 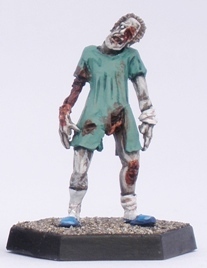 The final batch of patient zeds, this time painted in that familiar greenish scrubs colour. There were quite a few of these guys in this batch and I was getting sick of painting zombies (it does happen to me from time to time). But I persevered. I also left this gown colour to last as I thought that it would be the most evocative and therefore satisfying to finish. That in turn would help to spur me on through the last few figures. It has been a while since I painted a batch of figures as large as the patient zeds. I am not in a hurry to do it again. While the end product is very pleasing to me as I like how they came out quite a bit, some of it was a slog. So much so in places that it almost burned me out a bit. So its smaller batches from here on. The green came out quite well in my opinion: it looks pretty much exactly as I think it should. The green guys and the blue guys worked the best I think, but the others look fine too. Here is a shot of the whole lot of them, with Patient Zero from early 2010 plonked in too. His gown doesnt look as nice as the gowns on these guys (in some ways his colours were a test run for these figures). They look good as a group I think. I finished this figure while tipsy in front of the TV last night. 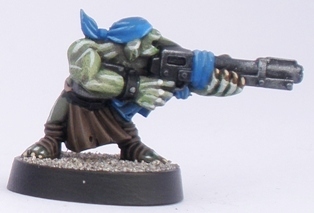 I am currently experimenting with different ways to paint ork flesh, hence the forty shades of green thing. How that for a tenuous link to St Patricks day? The figure is Gorillagon from Ramshackle Games. I bought it to serve as a “Da Krusher”, a special character from Gorkamorka who has had so much bionik work done to him that nobody knows who he really is anymore, least of all Da Krusher. This of course leads to a number of screwy rules relating to the models effectiveness in-game. Hopefully much hilarity will ensue. I modified the model slightly during assembly. I added a slightly smaller gun barrel into the soup-can calibre weapon in his right arm. 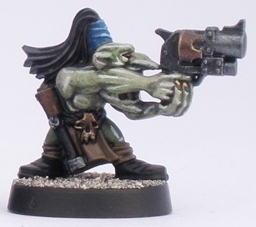 I also added a top mounted magazine from another ork weapon, as it looked a little too much like some oddball energy weapon without it. I didnt do very much work to the gun though. In-game it isnt that special (Krusher is a close combat type mainly) and I didnt want the gun to be misleading. 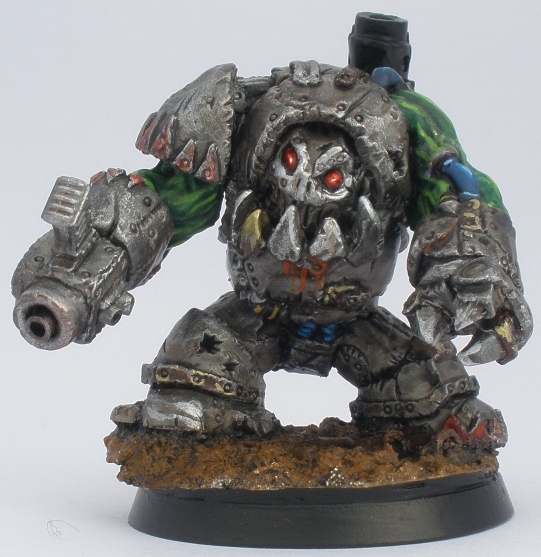 As befits the characters solo status I didnt tie its colour scheme to any faction of orks that I am currently painting. I did however try to paint the largely metallic looking model from a white undercoat. 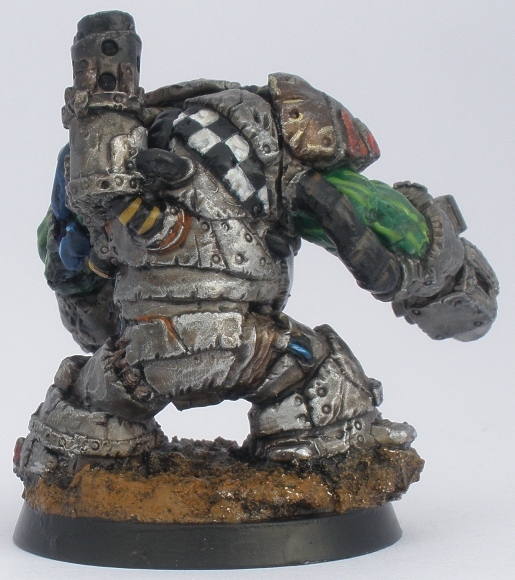 Generally I would approach a model like this by spraying it black and drybrushing it with metallic paints. This time I sprayed it white and alternated drybrushing of metallics with ink washes. I did this in the hope that I would end up with defined looking metallic areas but that the figure would not look too dark overall. Also worth noting is that I didnt bother even to highlight some of the cabling and other detail, all in the interests of getting the figure finished so that I can get working on some more stuff. I will let you be the judge of whether I got the balance right or not. As regular readers may know I am currently experimenting with quick ways to paint ork flesh. I tried another approach with this figure. I like some of how the green areas worked out, but as usual other elements of it irritate me. This is compounded somewhat by the fact that the organic areas of the figure are not brilliantly sculpted, so that the huge arms look a little like green tree bark or something now. On the plus side, I do think that it will look much better on models with better sculpted physiques (like the plastic ork figures). So I will go in that direction with my next batch or orks. Finally here is a picture of da Krusher standing alongside a gretchin, a human and an ork, just so that you can see that he really is a pretty big monstrosity. He also looks sort of sad I think, like he really just wants be friends, like in a sappy Disney movie. Right, I am off to shatter a national stereotype by spending the day drinking cheap Chilean Cabernet Sauvignon instead of stout. “An bhfuil tú ar meisce fós?” and all that “top o’ the mornin” jazz. EDIT 21/03/11: I forgot to note in the the post that Da Krusher is supposed to have a pair of Steel Horns. In game terms these make him more effective when charging into combat. I considered adding a pair to the model during assembly, but I thought that they would spoil the brutal, rounded shape of the figure, so I scrapped that idea. Presumably the incarnation of Da Krusher above charges teeth first into his opponents, with much the same effect as a pair of horns. Just in case that sort of thing bothers you. The game is strongly influenced by Mad Max II: The Road Warrior, except that instead of featuring Mel Gibson, actors from A Country Practice and pervert biker rapists it features orks. 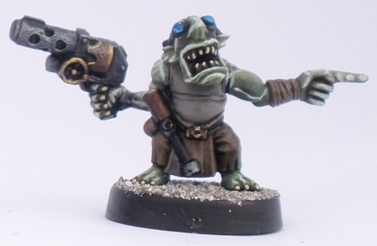 Gorkamorka occurred during an awkward adolescence for orkoid development in 40K. As a concept they had lost their way at some point before Gorkamorka was released, becoming gaudy buffoons rather than a proper barbaric menace. 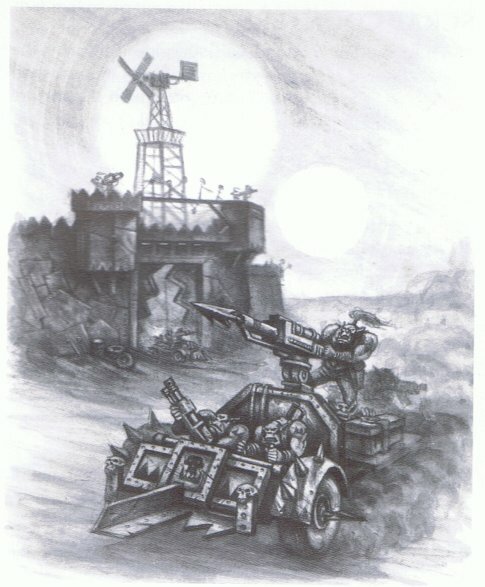 Although Gorkamorka definitely didnt wipe that image out (I mean the game is called Gorkamorka for crying out loud), it certainly laid the groundwork for the single-minded, homicidal galactic plague that they became in 40k the 2000s (and which they seem to be moving away from again these days). A lot of that was simply due to the top class miniatures sculpted by Brian Nelson for the GoMo range which took them from comical to monstrous. As a GW fanboy I bought GoMo (as it seems to be called online these days) when it came out. It sounded like fun and I had enjoyed Necromunda, which was largely an identical system. Unfortunately at the time I didnt have many opponents willing to get into GoMo so it didnt get much table time, just an afternoon or two. 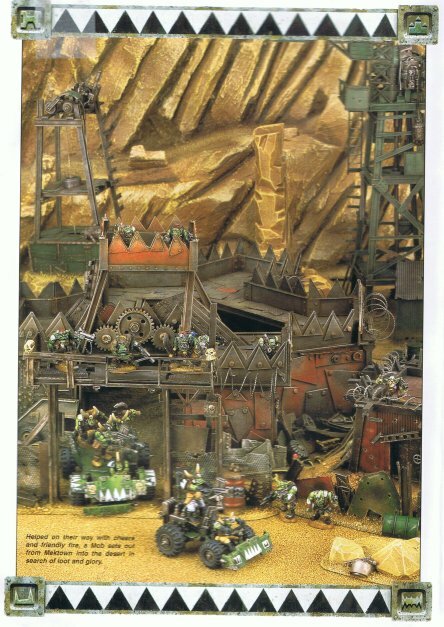 I bought some of the GoMo miniatures back then but they stayed in storage, until I sold on all of the orks to pay for a weekend boozing and clubbing in 2000. It was the right decision at the time. At least I kept the Mutie figures. Zip forward a decade and MT, SOS and I have a weekend of GoMo planned for June. 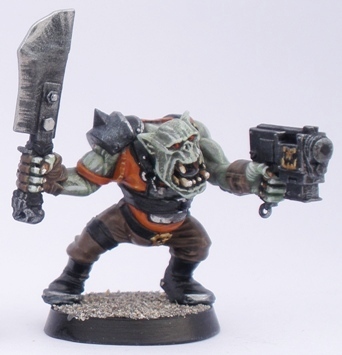 I dont play 40K any more, MT plays a teeny, weeny bit and SOS is getting back on the 40K scene having played in a weekend long tournament in January, which included painting even more Orks for his already vast, epoch spanning greenskin collection. We all have a lot of 40k (and other games) under our belts and we are all pretty familiar with the basics of the GoMo system. SOS already has enough miniatures assembled and painted to field numerous mobs. I have existing suitable terrain and the enthusiasm to make some more (like the ongoing Fort Grayskull and the recent Foam Rocks). 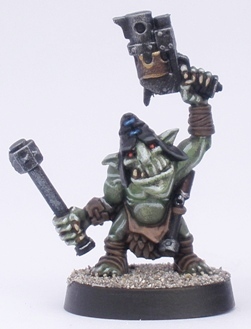 I am also looking forward to painting some of the nice ork figures that have come out in the last twelve years or so. Somewhat uncharacteristically, MT is a bit of a wild card this time. Often he is more reliable when it comes to getting a project finished for a deadline than SOS. This time SOS has more than enough models ready to go before he starts and MT is in a something of a painting slump (a familiar thing to most figure painters I think). Even if MT doesnt get his mob painted (it looks like even odds to me right now) he will still be able to use SOS spare figs so it looks like the project will materialise fully. Hopefully MT will get to play with figures that he has done himself though. He has had a Space Marine Land Speeder with wheels added to it knocking around for nearly a decade. That really should get its time in the sun and if not now then when? The GoMo rules system is familiar and will be quicker to play than Necromunda (its less fiddly for a few reasons). We have also agreed on a handful of very straightforward streamlining house rules. They should hopefully help us to get enough games in to watch our mobs gain skills and the like and for us to experience the over the top and hopefully entertaining intra-game Gorkamorka elements (visiting dodgy car mechanics and over enthusiastic doctors with a penchant for amputation). All of this means that many of the hurdles often encountered when we try to get some gaming off the ground have already been passed. Hopefully that means that we can concentrate on having fun rather than on rules intricacies or other tedious slog and just have a few giggles. That in turn means that barring something serious that some GoMo will definitely be played this summer. So I will be putting my progress on it up here for the foreseeable future, starting with the as yet unnamed ork and his gretchin buddies above. Here is a picture of one of the grots standing in the mine entrance part of the Fort Grayskull project next to a Copplestone figure (Dr Leghorn), for scale. In the interests of getting the project finished in a reasonable timeframe the ork and gretchin were painted quickly, with some areas getting simply a base coat and a wash. Not too bad as a prototype models I think, but I have decided to try a different approach overall. More on that at a later date. 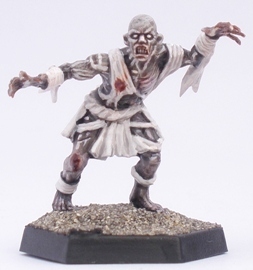 Back in mid December I put up a post showing my first batch of Studio zombies and Mantic ghouls and zombies painted to look like modern hospital patients. They went down well and encouraged me to finish the remaining twenty or so over the following period. I finished the lot at some point in February. 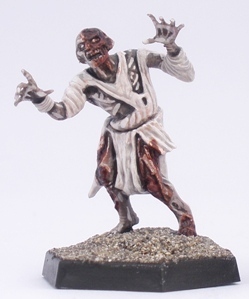 The first of the remaining three batches is zombies in white. As the zombie flesh that I have been painting is pretty monochrome, I felt that the gowns were blending into the flesh a little. 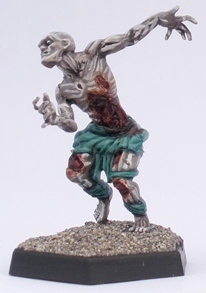 To remedy this I added a thin wash of old GW Purple Glaze over the flesh tones on this batch. Its pretty subtle, at least as far my painting goes anyway. I like strong contrasts that are visible at the distance from the viewer to the game table, rather than beautifully executed blending that is invisible at a distance. Still, the batch didnt turn out looking like Barney or anything, so it worked out fine. I find painting white to be a chore and these guys were no exception. I think that it came together in the end though. There is a GW component used in the group shot above, which makes it the only non-Studio or Mantic component used in the entire “patient” project. 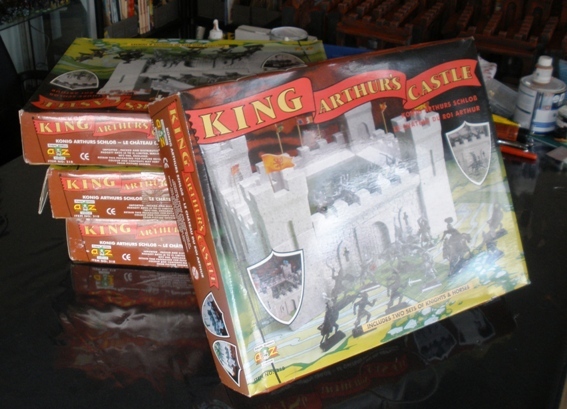 I bought a toy castle in 1995 or so because I thought that it would be suitable for use in 28mm gaming. I liked both its modular nature and its low price so much that I then went back and bought three more castles, just so that I could make one huge castle at some indeterminate point in the future. Then like many other projects the castle then got moved to the back burner for some forgotten reason. Since then it was dug out of storage twice. In 1998 the entire thing had a coat of textured paint and some minor structural work done to it. It then sat in a box until 2001 when I decided that I wanted to turn it into a pulp sci-fi space castle. Progress on that was limited to an evening or two sticking somewhat unconvincing leftover kit parts to castle sections while a friend sculpted a face over one of the windows. And that was as far as I got with that. Fast forward through a decade of reality TV and iPods right up to fully socially networked 2011. 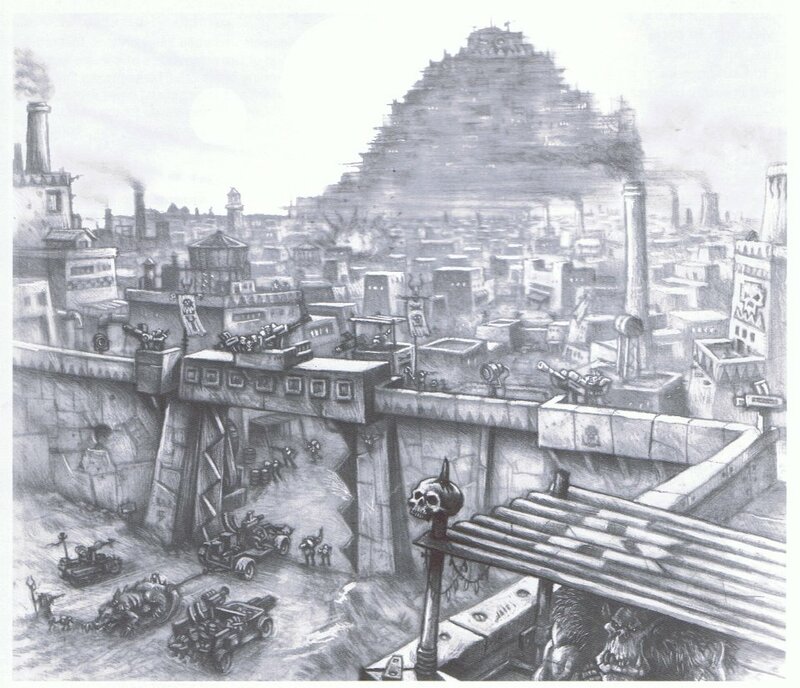 I wanted a post-apocalyptic type fort for a Mad Max/Gorkamorka style gaming weekend that I am planning in the summer. Rather than try to build one from scratch (which would take ages and which I really just don’t have the patience for these days) I decided to post-apocalyptify my castle. Some of the main influences were Mad Max II: The Road Warrior, the Buster Crabbe Flash Gordon serials and a bit of Masters of the Universe thrown in too. 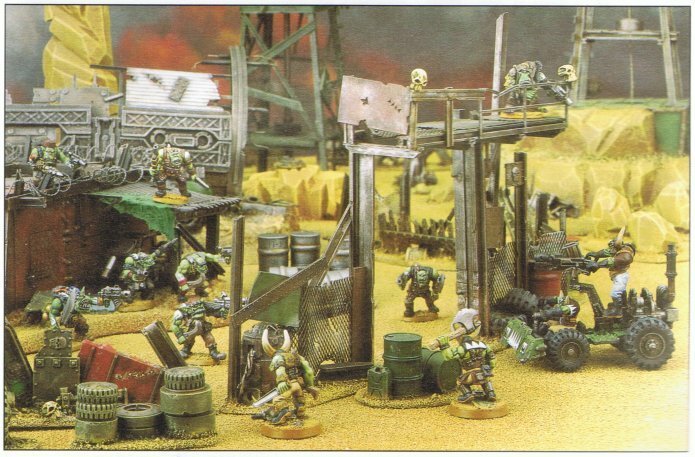 Additionally these images from the GW Gorkamorka rules were in the back of my mind most of the time. On the other hand if compromising with available materials in order to get something amusing and functional ready for use with your toy soldiers in a reasonable timeframe appeals, then maybe you might enjoy seeing how this project goes. This post is already too long, so I will include a shot of the entire thing as it stood at the start of the project. To be continued soon. Some zombies next if I can get suitable weather conditions for photos.